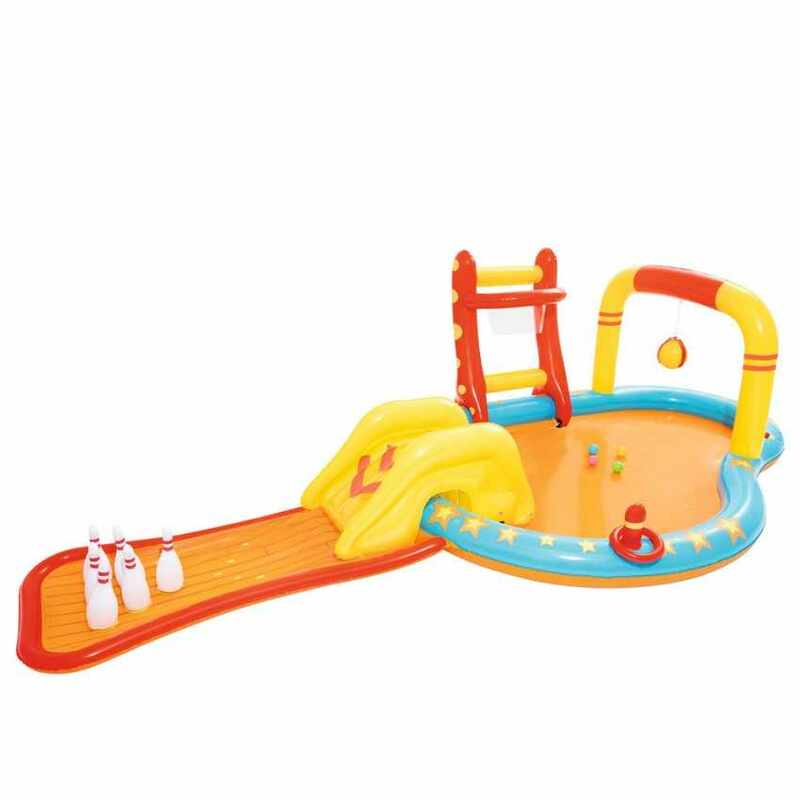 Bestway 53068 - Lil' Champion Play Centre, a kiddie pool equipped with many accessories and games for your childran to enjoy. 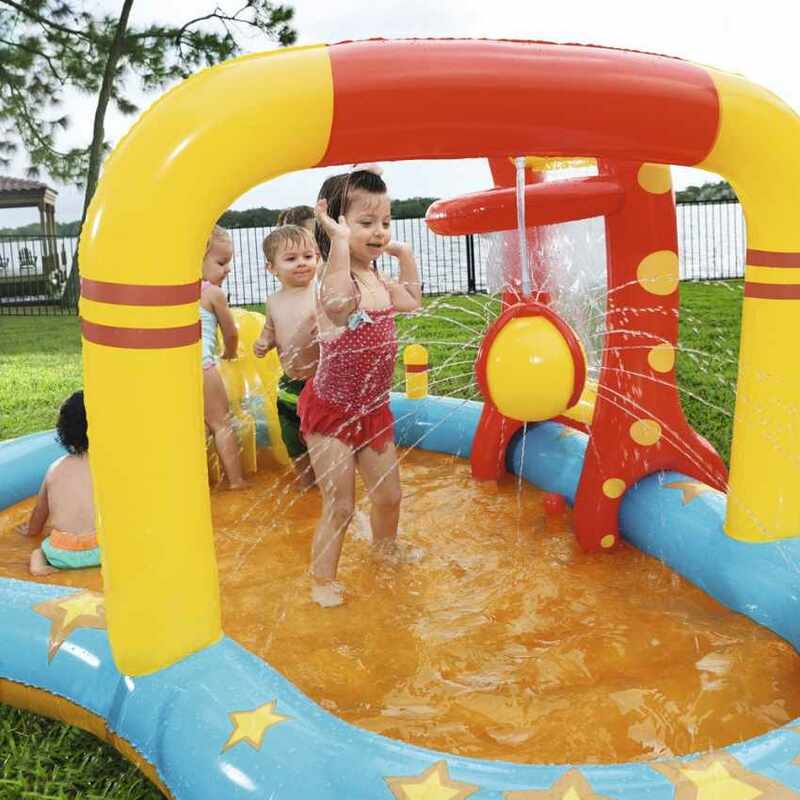 This inflaltable kiddie pool has been especially designed to maximize the fun your kids will have playing with it. Fitted with slides, pins, targets, even a sprinkling ball, and so much more. There is nothing missing to make children happy. 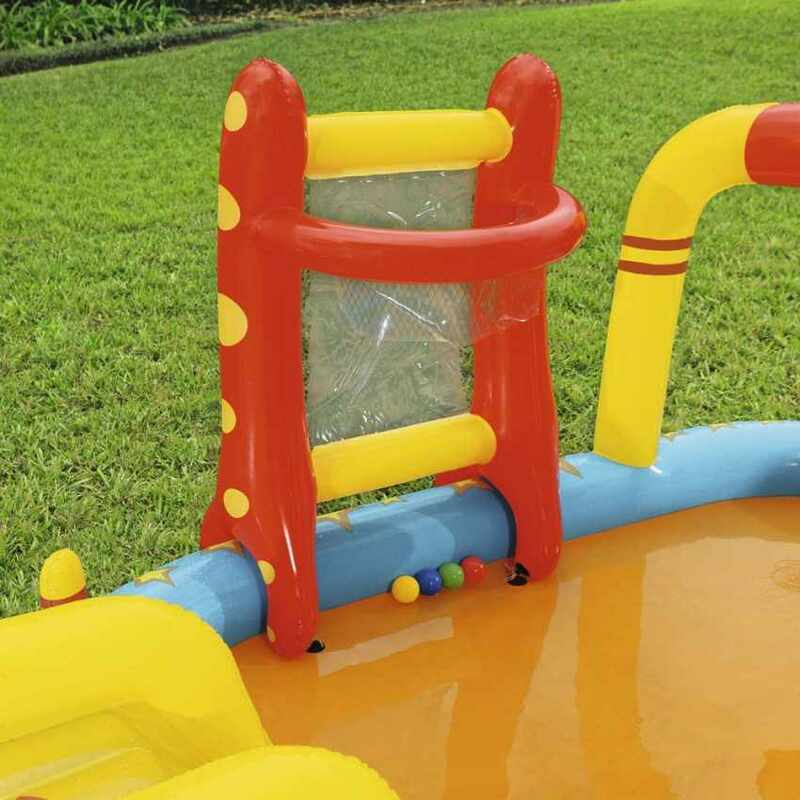 Built in multilayered viniyl this inflatable is highly durable but soft, a trully safe companion for kids, with no need for much maintenance also thanks to the draining valve to ease water drainage. The package includes pins, a removable slide, plastic balls, basket, a goal, a sprinkling ball, inflatable cushions and a patch for repairs. Many acccessories and toys to keep children engaged. Amazing play paddling pool for children with dinosaurs and water games! Once inflated, the pool is ready for use! It comes with 6 Fun balls wit a diameter of 8 cm. The mian dinosaur is removable and it creates a nice arch with its body. It also has a valve that, once connected to the water hose, starts sprinkling funnily. The slide is connected with a tank where you can dive. Toys and accessories included in the package: Dino hoop and Volcanic Ball Roller game. 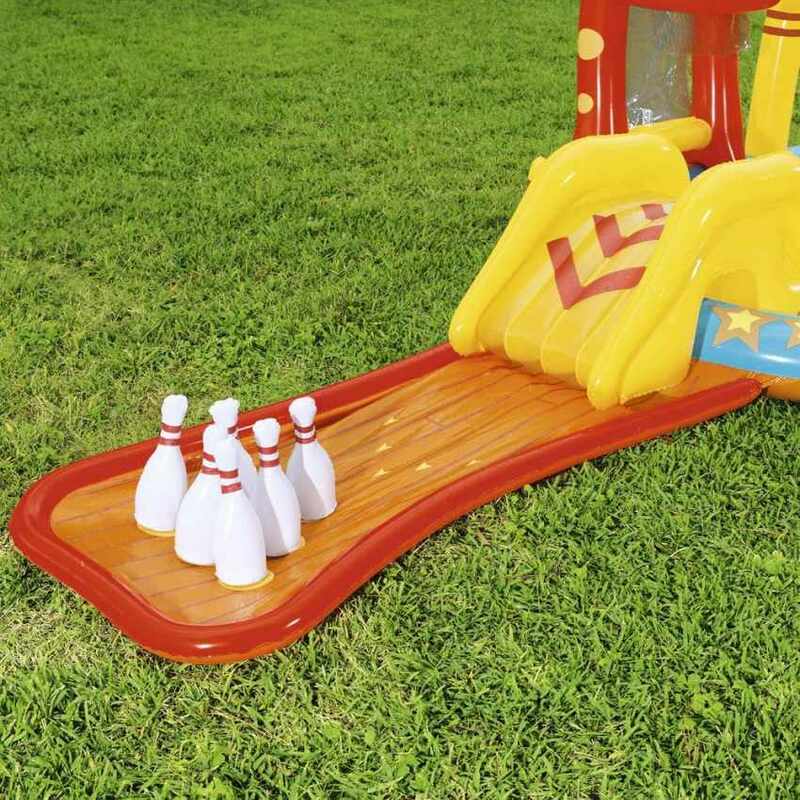 This inflatable is designed with a landing soft surface located at the end of the slide for added safety. Intex 57453 Rainbow Ring is a beautiful inflatable paddling pool for children. Easy to install and once inflated the pool is ready to be enjoyed! It comes with 6 Fun Ballz plastic balls with a diameter of 8 cm. Kids will spend countless time sliding down and then dive into this colourful and fancy pool. 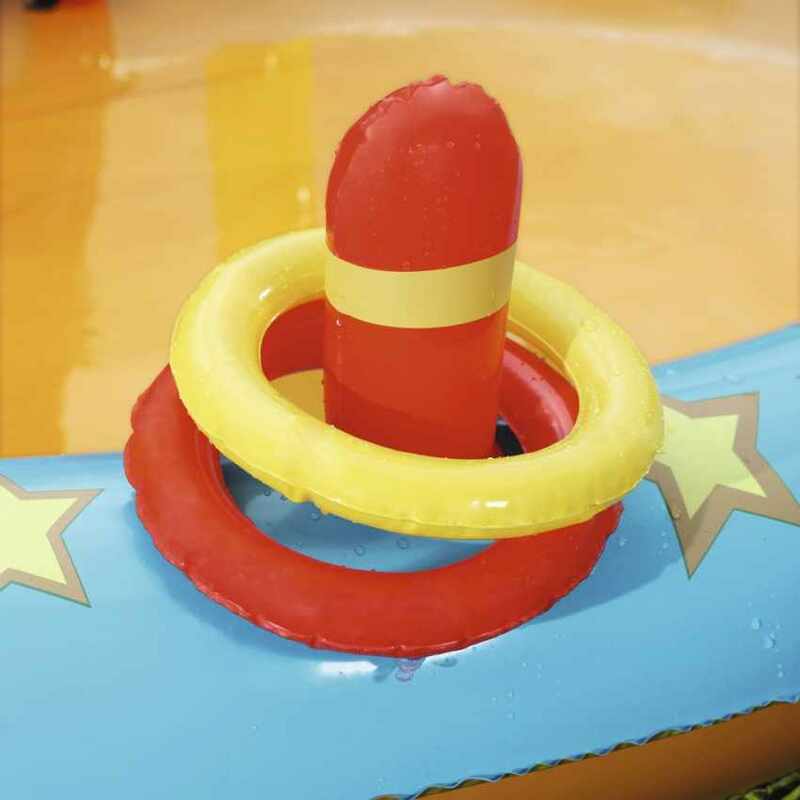 The set includes the following water games and accessories: a slide, a refreshing shower on the top of the rainbow, target to toss rings (4 inflatable rings included with the pool) and two slides for balls located at the sides of the pool. Intex 57149 Candy Play Center is a paddling pool with a sweet theme, full of accessories and details to amuse and inspire little kids. 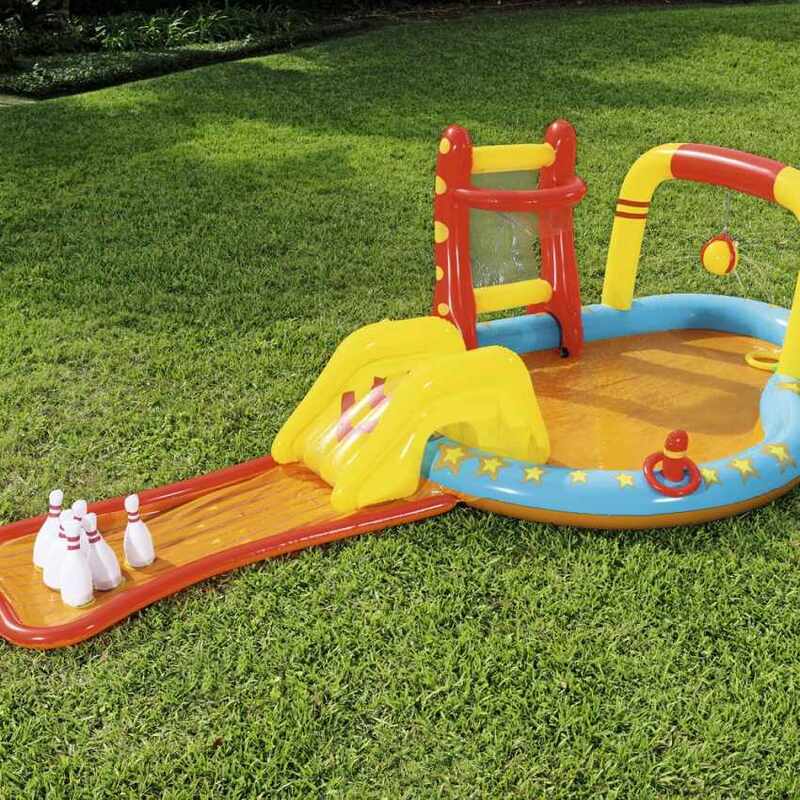 It includes targets, a sprinkling jet, a slide with padded landing, plastic balls ana many other accessories. Durable and completely safe for your children to enjoy - Measures: 295x191x130cm. Bestway 53052 is an inflatable kiddie pool playcenter with an inspiring and detailed aquarium theme. 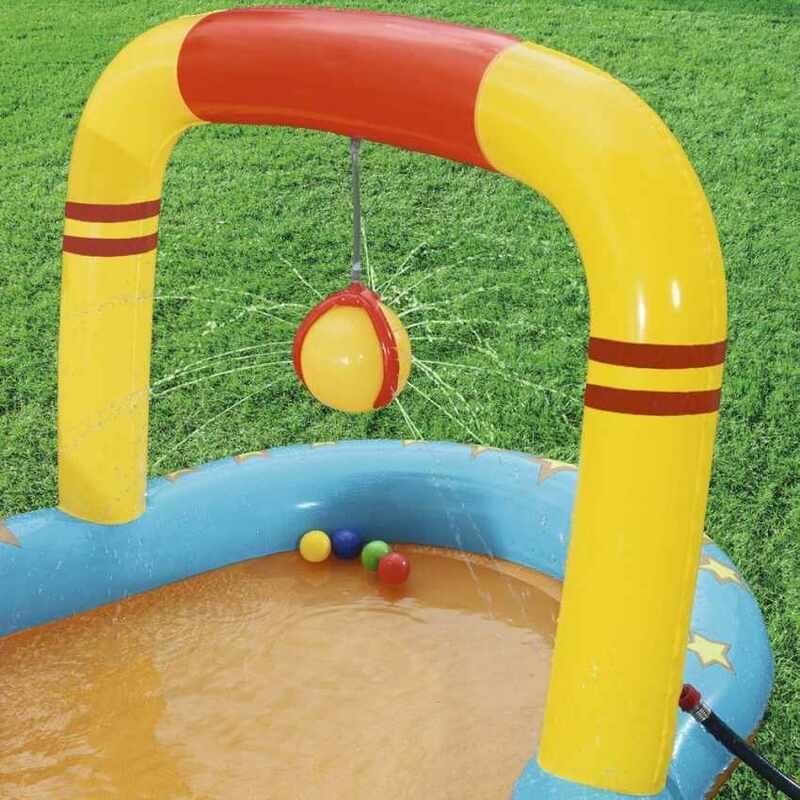 Equipped with many toys and accessories, this is an incredibly funny pool for your children. A removable slide shaped like a hyppo, inflatable octopuses, starfishes, dolphins and so much more for your kids to spend a magical summertime. Support for water jet and ring toss. Durable and safe for all children. Measures: 86 x 206 x 239 cm. Intex 57160 inflatable pool for kids perfect to play and have fun with a completely safe product Intex 57160 Happy Dino play center consists of 2 swimming pools connected with an amusing ramp that include toys and water spray, totally made of high-resistant vinyl to ensure a high-quality product and a completely safe amusement. The assembly is really easy, just inflate the pool and connect it to a water pipe or valve in order to fill it and in just few minutes you will have your pool. Intex 57149 inflatable pool is the new summer product, ProduceShop offers this amazing and reliable article together with all accessories at the best price online. Thanks to official Intex warrancy you will be totally satisfied.